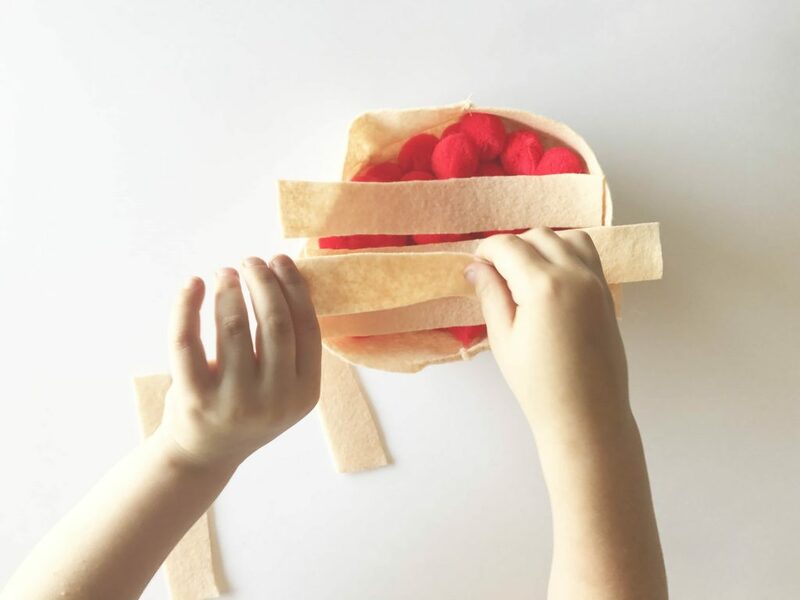 With the start of the school year and the fall season coming up, I was eager to create a few fun learning and craft activities for the kiddos that fit the upcoming season’s theme. The apple tree in our backyard already has tiny apples securely dangling from the tree branches and while we couldn’t use those, we were inspired to create a few fun apple activities to share with you and your kids! 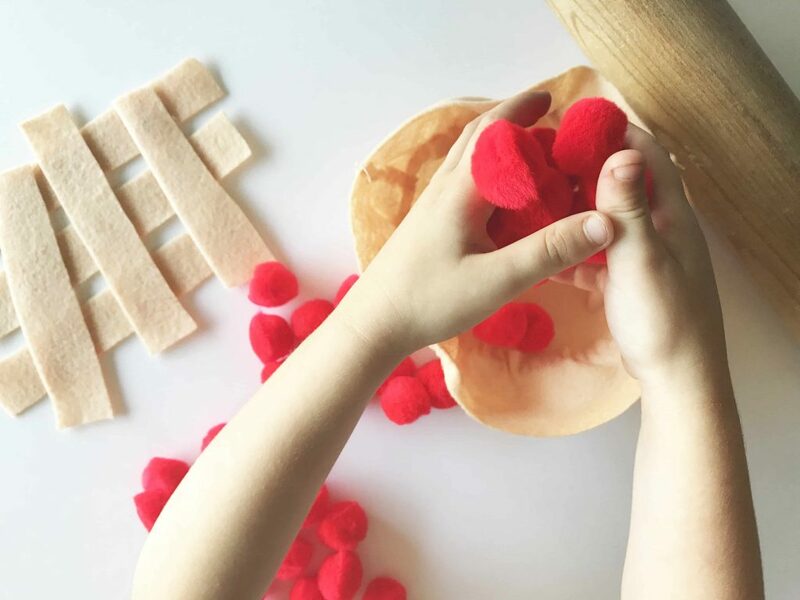 Not only do these sweet little activities inspire your children’s artistic abilities, but they give the opportunity to explore many subjects such as math, patterns, and science. 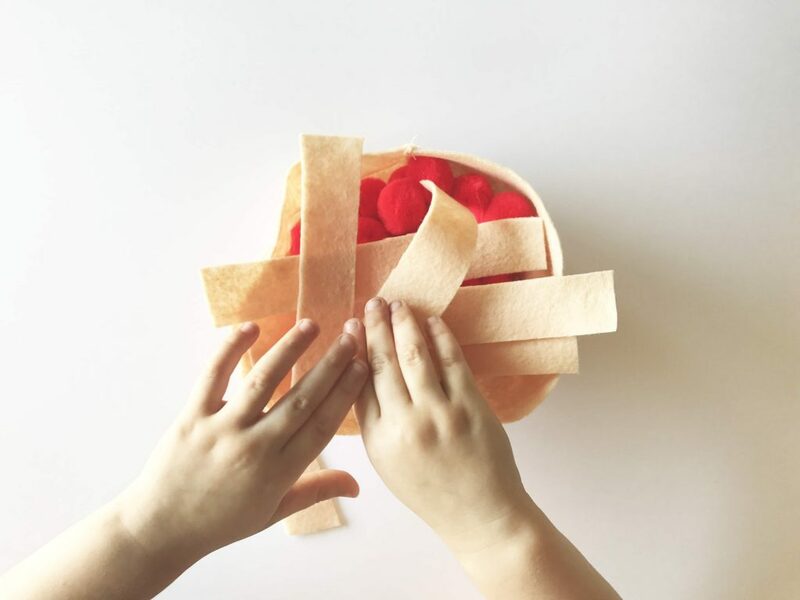 We hope you enjoy this fun felt apple pie craft! Our first activity was creating our mini felt apple pie. 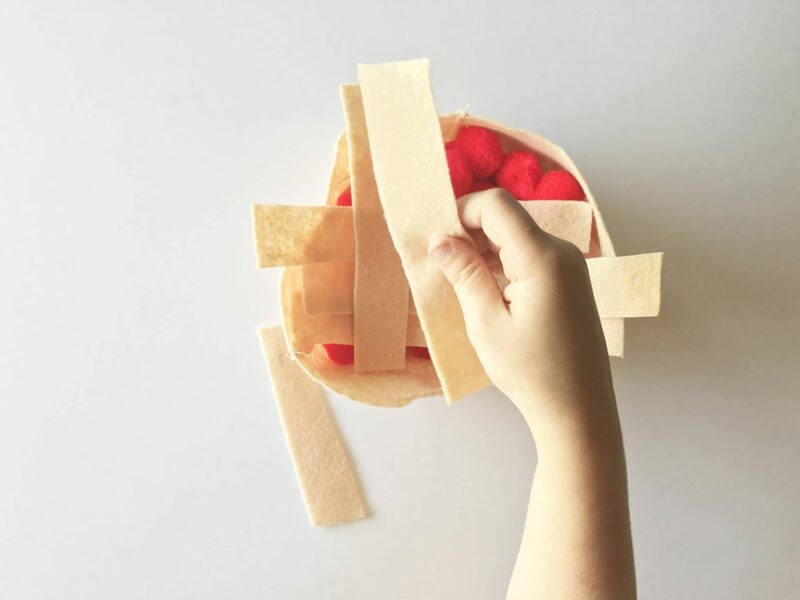 You can really go any direction with this, meaning you can take a few hours sewing together a perfect little pie or simply cut out your felt and whip out the hot glue gun. We went the simpler route. 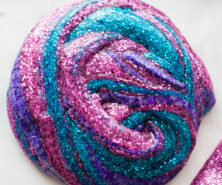 This craft was so easy to create! First, I cut out one 6″ round circle from the felt and then used my needle and thread to attach the side of the crust to the bottom circle to create a bowl shape. Once that was done, I cut strips of felt for the top of the pie crust. I laid out the disassembled pie and let little Stella get started on creating her masterpiece. She counted out each apple (pom pom) and sprinkled handfuls onto her pie crust. 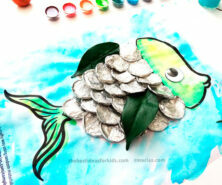 This gave us the opportunity to incorporate a bit of math into this already fun activity. 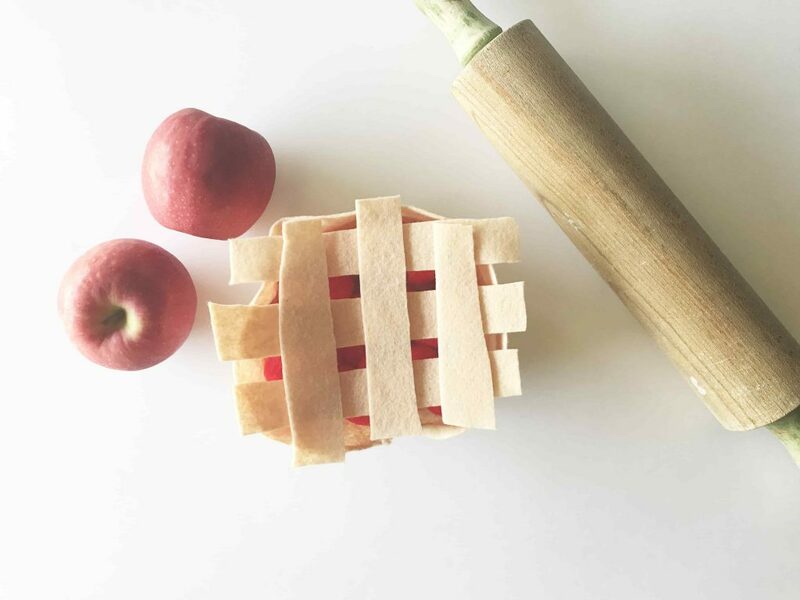 Once she had put the apple filling in her pie, she weaved the felt strips on top of her pie crust, creating a lovely little apple pie. 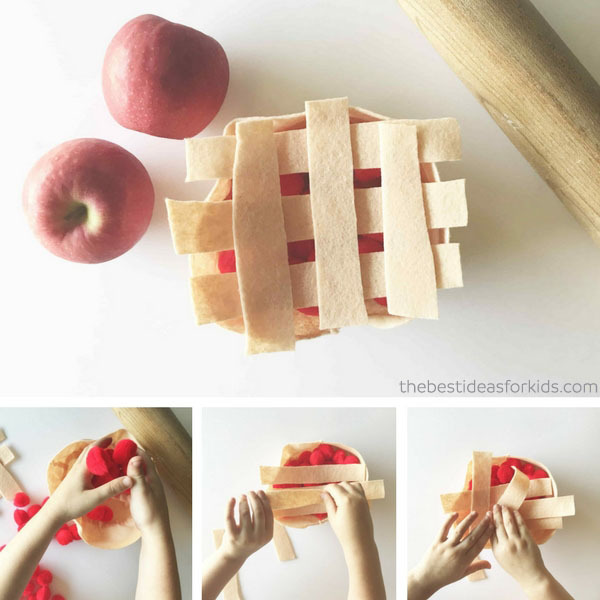 The fun part of this activity is that your child can play with it many times using the same or different colored pom poms to create blueberry pies, cherry pies, or chocolate pies! 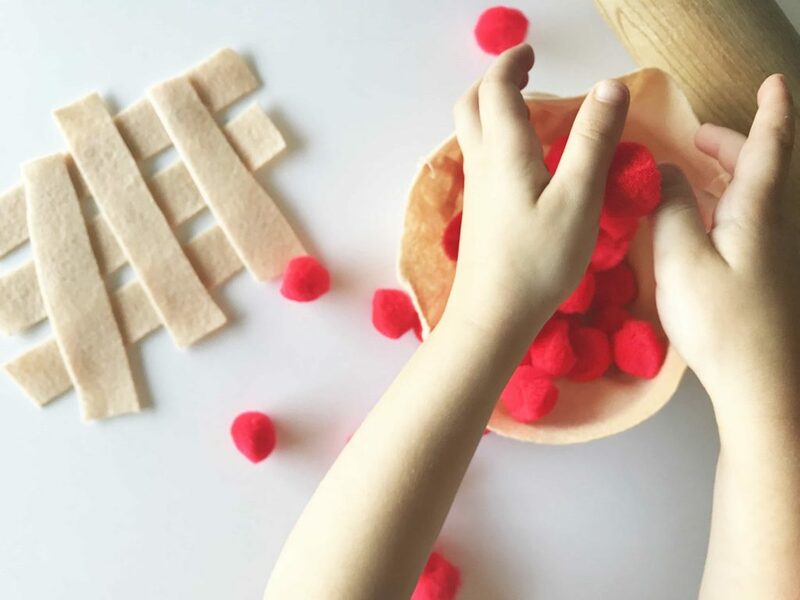 We hope you and your child have fun creating your own little felt apple pies! 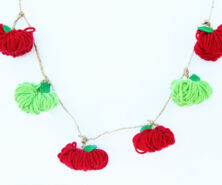 Want more fun fall crafts? Check out our Halloween crafts.